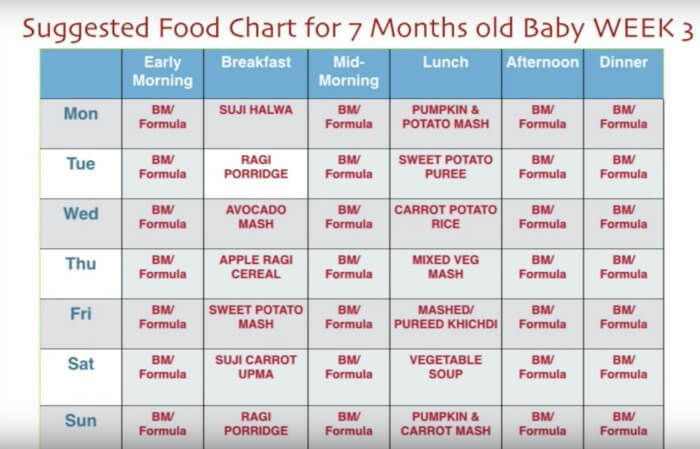 7 Month Baby Food Chart – Most 7 months old babies have had their first brush with solids to varying degrees and are usually ready to move forward from simple purees to more adventurous food. Many babies have also sprouted few teeth by now while many still do not have any pearlies. Despite this, most of them are ready for thicker mashes and combination food by this time. Always make sure you have introduced a food item singly before adding it to a combination food. This way you can keep track of any allergies/ reactions etc. Also, different babies will have different amounts of food any particular stage, so do not force-feed. Continue to breastfeed or formula-feed as and when required. 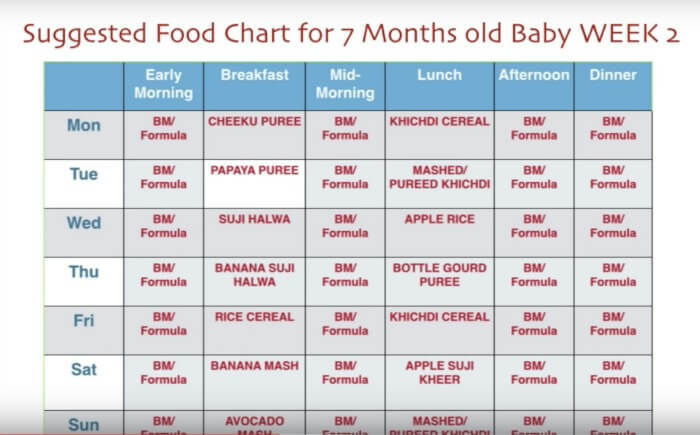 In 7 month baby food chart, we can introduce food which is more complex than previous month. Food should still be well-cooked and soft as well as mashed/ pureed depending on baby’s preference. We suggest simple yet varied options that you can introduce to baby week by week during the 7th month. We can start baby on 2 solid meals a day, if you have not started that already. Continue to give purees and mashes this week too. In week 2, you can introduce more complex foods like khichdi and apple suji kheer. In week 3, we introduce newer cereals like ragi and well as complex purees. 1) Keep following 3 day wait rule, whenever you introduce a new food. 2) Breastmilk or formula should still form the bulk of your child’s intake. 3) Increase the amount of solids as compared to previous month. You may also introduce finger foods in case you baby appears ready for it. 4) Many babies can show symptoms of constipation upon introduction of solids. Read more about what to do in case of constipation in babies. 5) If your baby does not like the new food that you offer, do not get disheartened. babies may sometimes take a few days before liking something new. 6) Feed your baby when s/he is sitting in a proper position safely in a high chair or booster chair. 7) Your baby’s first teeth may start to emerge, though in some cases first teeth may not appear till 12 or 13 months as well. And it is perfectly alright. 8) Baby’s hand-eye coordination improves by many times and s/he becomes increasingly proficient in picking up things. 9) Some babies may face constipation problem when a new item is introduced in diet. Increase fibre and water in diet and if it persists, discontinue for time being and reintroduce after a few weeks. You will need some basic supplies to make fresh food for your baby, if you do not already have these. None of these are a waste as I am still using all these in my kitchen, but these were a blessing during that first year when my daughter started eating solids. Buy a small 1.5 -2 litre pressure cooker to make fresh khichdi, dal pani, rice gruel, vegetable purees, soups and what not. I still use my little hawkins when I have to make something in small quantities. It is also handy to carry when you are travelling. A big size stainless steel strainer to strain your purees and juices. I don’t remember ever using blender to make purees, strainer did the job for me. Although I kept it separate while I used it for my daughter, I use this for everything now from straining flour to rice and what not. Potato Masher – This potato masher helped me a great deal when I wanted to mash my daughter’s food lightly. You may also use a fork for small quantities. later yo may use these for mashing your potatoes or bhajis. 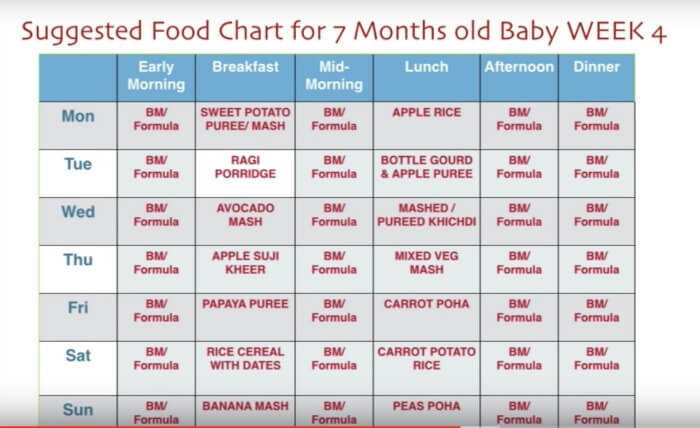 Here is the 7 month baby food chart in a glance. You can even make this powder at home. 3)Put these slices on a plate and place them in the sun for a couple of days till they get completely dried. 4)Now using a blender,you may powder it,sieve it and store in an air tight container. Add this to little warm water just enough to make it a paste.You can simmer on low flame if you want.Feed at intervals or according to your child’s acceptance. How to make that gourd and apple sauce? Kindly share the recipe. Have noted it, Amruta! Will share soon. 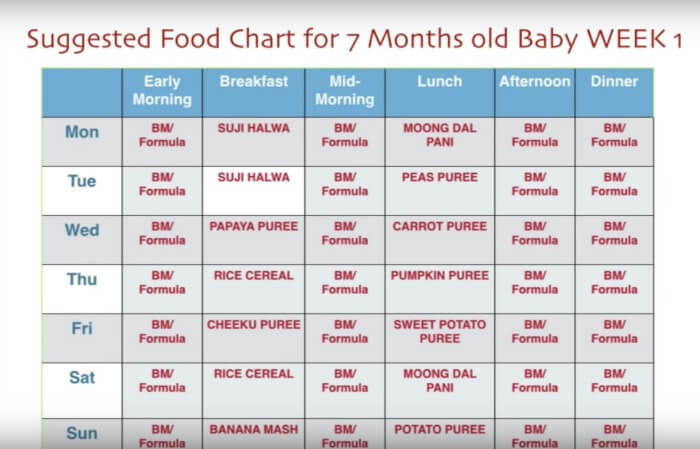 Hi Priya u shared a very useful information,my baby is in 7th month ,ur food chart is very useful me to start my baby a solids thanks for information.but am confused what veggies shud I give to my baby? I started carrots ,beans and beetroot mash other than that what veggies can I give plz help me out about this…. You can also give potatoes, peas, pumpkin, bottle gourd etc. Below links might help! Hi priya tat was very informative helped me putting my worries down.. Thk u 😊. I have one question.my daughter is 6 Mon old.when I start at rice meal in my baby. It simply means Breastmilk or formula. You have given weekly schedule for 6 months food but for 7th month there is one schedule only, what should be given on rest of the 3 weeks? At 7 months, just about quarter of a cup is more than enough. Do not force the baby. If she finishes, offer some more else stop. Hi Priya, this chat is very useful my daughter is 7 months and 2 weeks but she dont want to eat by using spoon, she cries alot when we use spoon feeding. What i do i put puree in her battle please help.